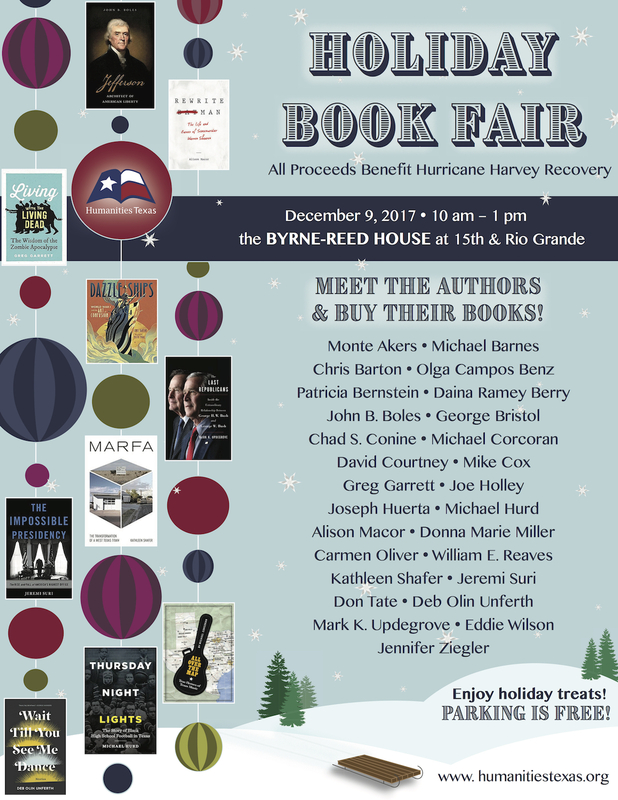 Humanities Texas is excited to announce that it will host its ninth annual Holiday Book Fair at the historic Byrne-Reed House in downtown Austin on Saturday, December 9, from 10 a.m. to 1 p.m.
A number of noteworthy authors—including Monte Akers, Michael Barnes, Chris Barton, Olga Campos Benz, Patricia Bernstein, Daina Ramey Berry, John B. Boles, George Bristol, Chad S. Conine, Michael Corcoran, David Courtney, Mike Cox, Greg Garrett, Joe Holley, Joseph Huerta, Michael Hurd, Alison Macor, Donna Marie Miller, Carmen Oliver, William E. Reaves, Kathleen Shafer, Jeremi Suri, Don Tate, Deb Olin Unferth, Mark K. Updegrove, Eddie Wilson and Jennifer Ziegler—will visit with the public and sign copies of their latest books, which Humanities Texas will offer for purchase at a discounted price. Available titles include works of fiction and non-fiction, with selections for both adult and youth readers. Humanities Texas will have books available for purchase at a discounted price, with all proceeds benefiting Hurricane Harvey recovery. Complimentary coffee will be available, alongside a sale of homemade and donated pastries and baked goods. All proceeds from the bake sale will also benefit Hurricane Harvey recovery. Humanities Texas would like to invite all book lovers to join in the holiday spirit. This event is free and open to the public. Free parking will be available in the St. Martin’s Evangelical Lutheran Church lot on the northwest corner of 15th and Rio Grande Streets. “Join us for a good read and a good cause,” said Michael L. Gillette, executive director of Humanities Texas. Please see www.humanitiestexas.org for more details about the event, including a full description of titles and authors. Download the book fair flyer for use with this press release.